If you have taken a look at the latest newsletter from Trafalgar Wharf and The Drystack you will have seen the exciting news that we are developing the wetdock! We are installing new toilets and showers, pontoons and permanent and visitor moorings. 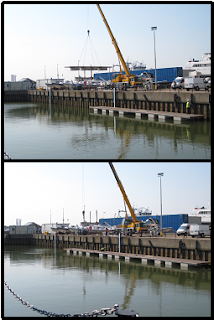 We have already dredged and today the new pontoons arrived! They are quickly being assembled and soon the new marina will start taking shape. Keep checking our news page and our Facebook page for updates. If you are interested in a mooring in the new marina please contact Corinne on corinne@trafalgarwharf.com or call 02392 387833.